What’s the future hold for franchising in 2014? What sectors should you keep your eye on? If you’re looking into becoming the owner of a franchise, it’s important to be a trend-watcher. It’s important to find out what today’s franchisors are up to. 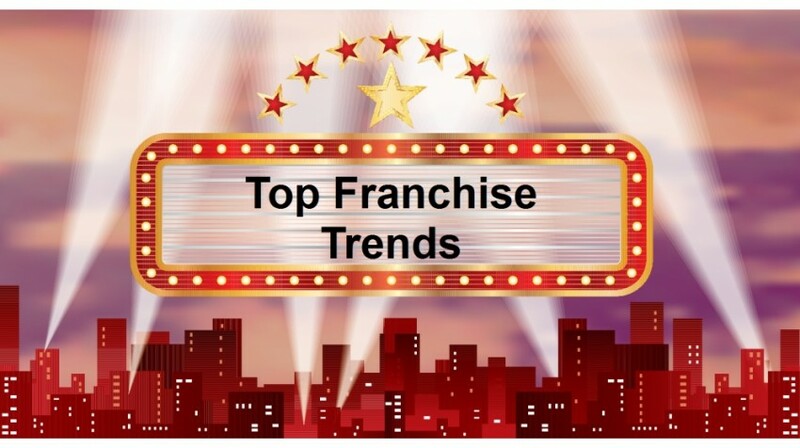 In this, my sixth annual top franchise trends article, I’m going to let you in on the top franchise trends for 2014 that are taking shape in the franchise industry. All of them are worth watching and some of them might be right up your alley. So let’s see what franchising has in store for 2014. IFG franchisees are in the business of helping companies improve their cash-flow by using a form of short-term borrowing called invoice discounting. Invoice discounting allows a business to draw down a percentage of their outstanding sales invoices, so they can have immediate cash flow. Revenue for franchisees comes from the fees they charge businesses that wish to implement this highly specialized solution to improving cash flow. Pest extermination as a business has been around a long time. Our view on bugs hasn’t changed during this time; they must be eliminated. Mosquito Squad is different because they only focus on outdoor pests like mosquitos and ticks. Venues like the ones I just listed take pest-control seriously and they’ll pay for specialized services like the ones Mosquito Squad franchisees provide. Brain Balance Achievement Centers offer programs that focus on the underlying issues resulting in most of the behavioral, developmental, and learning disorders that plague so many children today. No healthcare experience is necessary to become an owner. This franchisor is looking for people that have the desire to make a difference in the lives of children and their families. Rapid Recovery, a refrigerant recovery franchise business. WG Storage and Delivery, a franchise that provides high-end moving and storage solutions. UFC Gym, a fitness franchise offering boxing, kick-boxing and basic mixed martial arts training and workouts. OsteoStrong a franchise offering a natural wellness based system designed to improve the symptoms of Osteoporosis, Osteopenia, and Fibromyalgia. Kona Ice a franchise that sends tropical-themed frozen dessert trucks to children’s events, corporate events and fundraisers. A comprehensive article on the top franchise trends wouldn’t be complete without mentioning some of things taking place in franchising’s most visible sector, food franchises. One of the things I’ve been watching is the trend towards self-serve. Franchisors in the frozen dessert segment are the ones that have really been focusing on self-serve, especially frozen yogurt franchises. The Fuzzy Peach is a young franchisor out of the Wilmington, North Carolina area, offers a rotating array of toppings that customers add to their favorite frozen yogurt selections. The end product is then weighed and charged accordingly. Several other franchises in the frozen yogurt sector offer self-serve including, FroyoWorld, CherryBerry Self Service Yogurt Bar, YoGo Factory, Yogurtland, and Zinga! The newest segment in self-serve food franchising combines vending machines with healthy snacks. Vending machines have always been self-serve. It’s just that they’ve never really offered a lot of healthy choices for consumers to purchase…until now. Headquartered in sunny San Diego, Fresh Healthy Vending has 200+ franchisees servicing over 2,300 vending machines. One of the niches they’re concentrating on is military bases, where there are always hungry men and women that need to stay in tip-top shape. Human Healthy Vending claims to be “a socially responsible franchisor of healthy vending machine and micromarket franchise businesses.” Their offerings include vending machines specializing in coffee, and a large selection of machines offering fresh fruit and even locally sourced products. There’s also an option to add a 23-inch LCD video monitor to the vending machines to stream ads for additional revenue opportunities. There are also a few business opportunities – which differ from franchise opportunities – being offered in the vending machine space including Grow Vending, Healthier4You Vending, and Naturals2Go. It’s all about mobile for 2014. The importance of mobile technology in franchising can’t be overstated. Today’s franchisees need to have access to their businesses when they’re not on-site. They need to have the power to make decisions while they’re on the go…decisions that can affect the profitability of their franchises. Franchisors need to make sure that their corporate websites are optimized for mobile viewing, so their future clients, customers and prospective franchisees will stay engaged long enough to get information and take action. Today’s busy consumers are using their mobile devices for everything from online shopping to surfing locally for places to eat. They’re also using the Click to Call feature that more and more mobile business websites are featuring. Franchisors need to make sure that their franchisees can capitalize on every opportunity that’s increasingly coming from people using mobile devices. Some fast food chains are investing in Point of Sale (POS) systems that can accept payments from their customers’ mobile devices. This trend will gain momentum in 2014. Little Caesar’s Pizza encourages website visitors to download branded ringtones to their smartphones in the hopes that Little Caesar’s will remain top of mind when it’s pizza time. Great Clips, a hair care franchise with over 3,400 locations, offers online check in for clients that would prefer not to wait for a stylist once they arrive at their local salon. Mobile technology use will continue to grow in 2014, and franchisors need to continue finding ways to utilize it for maximum benefit. They’re starting to get louder. They’re starting to have more impact… more clout. “They” are the franchisees. They’re the ones who have put their own money on the line in order to be in business for themselves. And some of them are starting to have real impact. Some of them are starting to change things in franchising. For example, several franchisees of McDonald’s decided that they’re not going to take it anymore. This past summer a group of them banded together and formally complained to corporate about the increasing fees that McDonald’s charges them and their shrinking profits. There was also what I’ll call, “franchisee feedback” concerning the Dollar Menu, and the lack of profit because of it. Well, someone at corporate listened, because the Dollar Menu is no more. McDonald’s franchise owners are a powerful bunch. They’re some of most elite in franchising. They have an amazing and very powerful brand (and system) behind them. And, even though their profit margins aren’t what they used to be, they really do have a pretty good thing going. They want (for the most part) to stay in business. As opposed to the next group – because they’re out of business. Disgruntled ex-franchisees (or soon to be ex-franchisees) are some of most vocal around. For the most part, these franchisees aren’t looking for change. They’re looking to recoup their losses. A few of them even focus on preventing others from losing their money. You can thank the invention of the Internet and the still-growing popularity of social media for the ease with which dissatisfied franchisees can voice their feelings. A couple of websites immediately come to mind when it comes to learning which franchisors are getting heat from their franchisees. Ripoff Report is a no-holds-barred website that prides itself on honoring free speech. Type “franchise” in the search box and you’ll find information on all sorts of things related to franchising. Everything from supposed faulty heat pumps that were sold and installed by heating and air conditioning franchisees and/or their employees to fitness franchises that possibly went out of business and aren’t refunding membership dues are listed. You’ll also find complaints from franchisees that have supposedly lost their money on specific franchise opportunities. And, once in a while, there will be a complaint about a franchise broker or franchise consultant who supposedly sold an unsuspecting franchise business buyer a franchise that turned out to be not as described. If you’re going to use a website like Ripoff Report as part of your research on a franchise, you have to be willing to do a deeper dig into what you’ve found. See if you can find out more about the people or companies mentioned in the complaint by typing the name into a search engine and seeing what comes up. Also make sure you mention what you found to your franchise sales rep and to the franchisees that you’re contacting as part of your due diligence. That way you can hear both sides of the story. I’ve known Sean Kelly, the proprietor of UnhappyFranchisee.com, for several years. He’s hilarious and can write with the best of them. He’s been in franchising longer than me and has heard his share of stories about franchise concepts that didn’t quite make the grade. That’s probably one of the reasons he launched his website a few years ago. His other reason? Like me, he wants to make sure that today’s would-be franchise owners have all the information – the bad and the good – about the opportunities they’re thinking of investing in. Fact: Most people who are looking at franchise ownership are doing so for the first time, so there are bound to be mistakes made. But, sometimes the mistakes seem to be made by the franchisor. The Unhappy Franchisee website has several examples. And, as an added bonus, the comment area of the site features ex-franchisees of some of the franchise concepts that have been reported on sharing their true-life stories. Franchising, like any industry, includes great companies, average companies and lousy companies. The trick is to find the ones that excel in their niches. Make sure that your research includes conversations with current franchisees. They’re the ones who have already taken the risk. They’re the ones who are working in their businesses every day. They’re the ones with the answers. There are plenty of good franchise opportunities for you to check out in 2014. I only scratched the surface with these franchise trends for 2014. It’s up to you to find one that you feel offers the best chance of success.